As per a research conducted by the ‘Office for National Statistics’, the European Immigrants account for approximately 10 percent of the workforce in certain sectors in the UK’s economy. This research was conducted with an aim to focus on the severity of imposing restrictions on the immigration after the Britain Exit which happened during June 2016. The data released by the ‘Office for National Statistics’ more than 2 million immigrants from the European Union have been employed in various economic industries which include financial, hospitality, healthcare and manufacturing sectors during the calendar year of 2016. The ONC research has revealed that immigrants from the Eastern part of the Europe are more likely to work for prolonged working hours and earn wages lower than other co-workers. And also most of them are over-educated for their jobs. 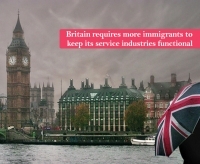 As per the analysis, Immigration is predominantly significant for Britain’s health service and its wholesale and retail, public admin and hospitality trades functional as more than one and a half million migrants are working in these sectors. The ONS study has shown that the foreign workers are more likely to be in the jobs they are overqualified for than their counterpart UK nationals. Nearly 15% of the nationals of the United Kingdom were working in professions they were believed to be over-educated for related with nearly 2 in 5 non-UK nationals.